NASA's Juno spacecraft obtained this color view on June 21, 2016, at a distance of 6.8 million miles (10.9 million kilometers) from Jupiter. As Juno makes its initial approach, the giant planet's four largest moons -- Io, Europa, Ganymede and Callisto -- are visible, and the alternating light and dark bands of the planet's clouds are just beginning to come into view. 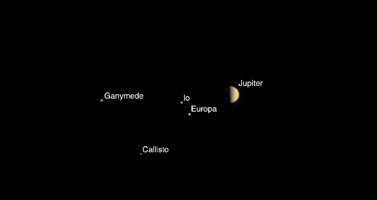 Juno is approaching over Jupiter's north pole, affording the spacecraft a unique perspective on the Jupiter system. Previous missions that imaged Jupiter on approach saw the system from much lower latitudes, closer to the planet's equator. The scene was captured by the mission's imaging camera, called JunoCam, which is designed to acquire high resolution views of features in Jupiter's atmosphere from very close to the planet.